I often wonder how my life would have been different had my autism diagnosis come in preschool, or elementary school, or even middle or high school instead of adulthood. Would I have received appropriate therapy and support to develop social skills and confidence, or conversely, would I have received the kind of inappropriate, punitive, anxiety producing therapy that has come into fashion among some parents of autistic children? Christopher is portrayed as elitist, violent, and lacking empathy. If this book were my only or primary exposure to representations of autistic people, I would think they were threatening and cared only about themselves. The way the author chooses to portray Christopher makes me worry that some people will assume that harmful treatment toward autistic people is okay, or even deserved. Even in the best case scenario, this book does not give an inexperienced reader any sense of how an autistic person could be an interesting conversation partner, or a friend, or a kind person. Like many earlier works with autistic protagonists and major secondary characters, Haddon’s novel was written by an outsider appropriating the voice of an autistic person — and getting it wrong. Other books from this era (and even more recently) have normalized or justified the scapegoating, abuse, exclusion, or institutionalization of autistic children. To an autistic reader, these books present the world as a hostile place where any misstep or meltdown can lead to painful, often life-altering consequences. 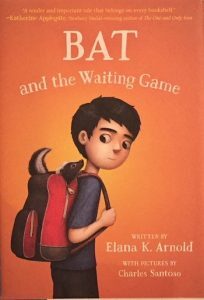 Fortunately, in recent years, there have been an increasing number of books that portray families and communities that support and nurture autistic children and can serve as models for children, caregivers, and teachers in real life. One of these is the BAT series for middle grade readers, written by Elana K. Arnold. Arnold is not autistic, and one way she shows consideration for the voices of autistic people is not trying to tell the story in first person — in other words, not appropriating a voice she doesn’t share (which often turns into creating a stereotyped, inauthentic Autism Voice). 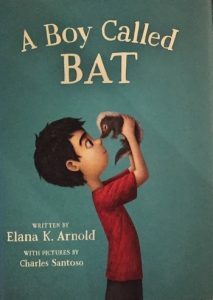 The BAT books — A Boy Called Bat (2017), Bat and the Waiting Game (2018), and the forthcoming Bat and the End of Everything (2019) — portray 10-year-old Bixby Alexander Tam, aka “Bat,” whose mother is a veterinarian and who is himself fascinated by wild animals. Bat has been diagnosed on the autism spectrum, and his divorced parents, his teachers, and his classmates do an admirable job of accepting him, meeting him halfway, and helping him to face his unique difficulties. In school he makes a good friend, as he and Israel bond over the skunk he’s raising and Israel’s gardening project. Things don’t always go smoothly in their friendship, but they work it out, and both grow in the process. We see Bat contributing to the community, appreciate his humor and caring nature, and follow him as he matures and finds his place in a neurotypical world with the help of those around him. For autistic readers, the BAT series offers safety and reassurance — the possibility of acceptance, understanding, and belonging. For neurotypical readers, the books model good friendship and show the cool things autistic classmates know and do. 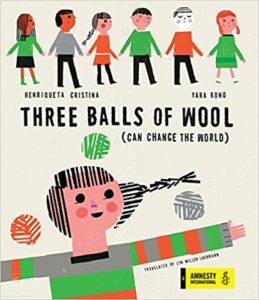 Written for younger children, the BAT books are appropriately sunny, but as kids grow, they see that the world is complicated and bad things happen. 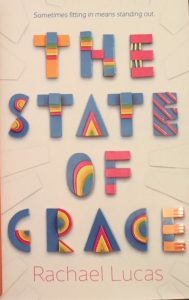 Rachael Lucas’s YA novel The State of Grace is written by an autistic author from Scotland, and the book was published in the UK two years before coming out last month in North America. With its setting along the Scottish coast, it is a good choice for #WorldKidLit month (which includes books originally published in English outside North American as well as those in translation) as well as a nuanced treatment of the family and community in which Grace lives. Like Bat, Grace has been diagnosed on the autism spectrum and has accommodation at school, a pass that allows her to leave class if she becomes overstimulated. Some of the students, most notably mean-girl Holly, mistreat and bully her, but in a twist on the usual trope, Holly — not Grace — is the person that no one wants at their party. Like Bat, Grace finds joy and a place in the world by caring for an animal, in her case a horse. She has a best friend who stands by her and a first boyfriend. Through her depiction of Gabe and Grace’s relationship, the author challenges the stereotype of autistic people as uninterested in or unable to establish romantic relationships. Not everything is sunny in Grace’s world — family changes and the arrival of her mother’s old friend have upset not only Grace but also her younger sister who acts out in a different way, and Grace makes a bad decision to impress Gabe and her other friends that has serious consequences. But while the consequences are serious, and realistic, they do not lead to Grace’s permanent expulsion from her community. Second chances exist for her. I’ve explored these two authors’ work for two reasons. One is that after many years, I’m working on a novel with an own voices autistic protagonist. Like Kiara in Rogue, he isn’t diagnosed, but in this case for reasons that are central to the story. Not having a diagnosis means not having an aware, supportive community, but in the historical context of the new novel, the community would not have been supportive. The book takes place in a society that tries to erase all differences, and for a young man keen on logic and honesty in his relationships, the blatant hypocrisy and lying that pervades his society makes it a very difficult place for him to live and thrive. Ultimately, his support comes from friends, and when he and his two friends confront danger together, as a team, he finds his place and his power. The other reason for my interest in supportive communities is that the place and time I chose in many ways parallels the direction the United States is going in today. The cruelty of those in power, their hypocrisy (“one set of laws for us, another for you”), their relentless promulgation of lies, and their treatment of people of color, immigrants, Muslims, LGBTQ+ persons, and those with disabilities — who they see as at best an inconvenience and at worst targets for elimination — means that we have to band together and support each other. The BAT series and The State of Grace are models of what that support should look like with respect to neurodiversity. They’re a starting point for how we should all treat each other if we’re going to resist effectively and bend the arc of history back toward justice. Thank you, Annette! I’ll keep you posted! Right now, I’m doing another round of revisions before I send it to my agent and let her decide whether it should be submitted as YA or adult. I’d like to go with YA, and that’s what I’m focusing on in this revision round. Used to work summer camps and always had at least 1 kid in the spectrum. Lovely kids. Thanks for sharing these books, people really ought see their POV in life. I know they amazed me more than once. Thank you, John! And by reading books written by autistic authors, people who work with kids on the spectrum will have a better understanding in advance as well as titles to recommend that show kids they can write their stories too. Lyn, I always learn so much from your essays. Can’t wait to read both the BAT series and STATE OF GRACE. Thank you! They’re definitely worth the read! I’m looking forward to the third and last in the BAT series myself, and will miss it when it’s over.